While most of the country was trapped indoors last week due to some of the coldest temperatures in over 20 years, my family took advantage of the pristine snow covered hills and trails and ventured outside. Not only was it great to get out of the house while everyone was else was trapped inside, it was actually quite comfortable thanks to our winter gear. So how did we do it? The answer is simple: we were covered from the head down in Canada Goose. For those of you that have been suffering all winter because you’re not familiar with Canada Goose, let me give you a bit of their back story. Starting out in a small warehouse in Canada over 50 years ago, Canada Goose started to gain international awareness when it started using Canadian Down and Coyote Fur to ensure it’s gear could hold up in the most extreme of temperatures. And hold up it has, as Canada Goose has been worn by a Guinness World Record holder trekking to the South Pole, a four-time Iditarod Champion, Everest climbers and countless others. As the years went on, Canada Goose also began developing more light weight gear for less extreme conditions, which led them to introduce the Thermal Experience Index (or TEI for short). The TEI system was designed to ensure that when you purchase from Canada Goose, you’re getting the exact level of warmth you are looking for. Because despite how cold it may feel in the winter, we don’t always need gear that caters to South Pole temps. So long story short: Canada Goose develops winter gear capable of withstanding the harshest weather conditions known to man, and they also develop gear that meets a broader variety of everyday conditions as well. 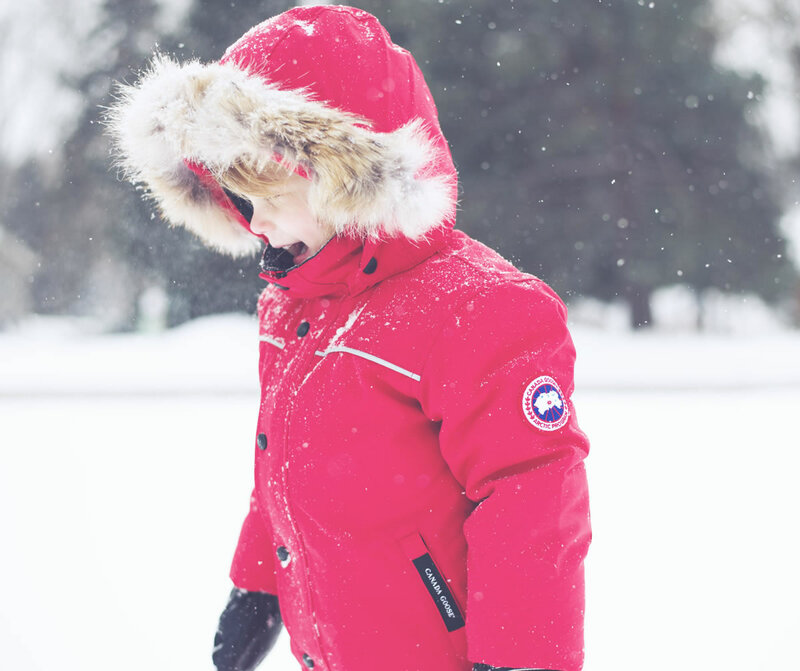 Now that you know a little bit more about the brand, let me tell you exactly what Canada Goose gear my family and I wear to stay comfortable and happy during our outdoor adventures, starting with my kids. I’m starting with children’s gear because let’s be honest: if your kids are cold, they aren’t happy, and if your kids aren’t happy, no one is happy. Picking the right Canada Goose for kids in the winter is simple: I dress both of my children in a Canada Goose Grizzly Snowsuit – a one-piece snowsuit that has not only allowed us to enjoy winter no matter how cold the conditions, but one that also significantly speeds up the process of getting dressed and out the door thanks to its one piece zippered design. The Grizzly Snowsuit is incredibly warm thanks to 625 fill power white duck down along with a huge coyote fur lined hood. If you’re unfamiliar with down fill power, it’s a way of measuring the loft or fluffiness of down – the higher the number the better. Most of the high quality children’s coats I’ve looked at seem to top out around 550 fill power, which is considered good. A fill power from 550 to 750, however is considered very good, as it’s a higher quality down that creates even more warmth for your kids. 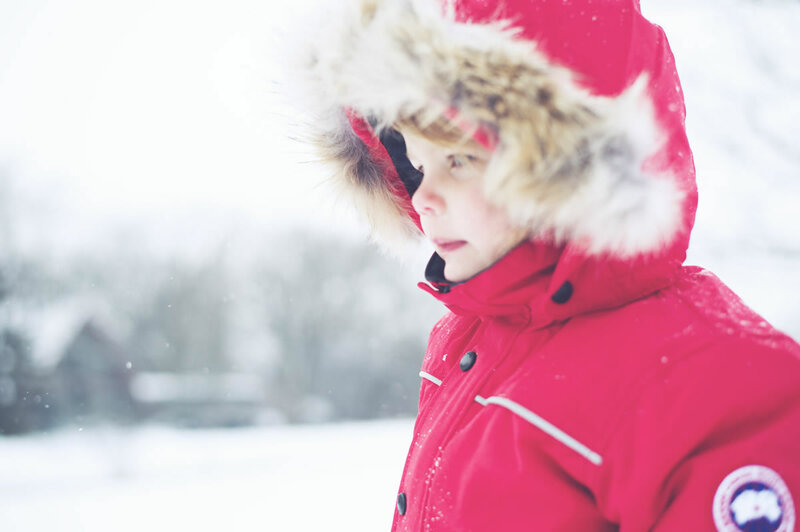 In addition to the down, the coyote fur wrapped hood also plays a crucial role in keeping your little one warm. It’s designed with different length hairs that act as a wind break to help protect exposed skin, and unlike synthetic materials, coyote fur naturally never freezes or holds onto water, meaning it can maintain it’s soft texture to mold to your head and keep the warmth within the hood. 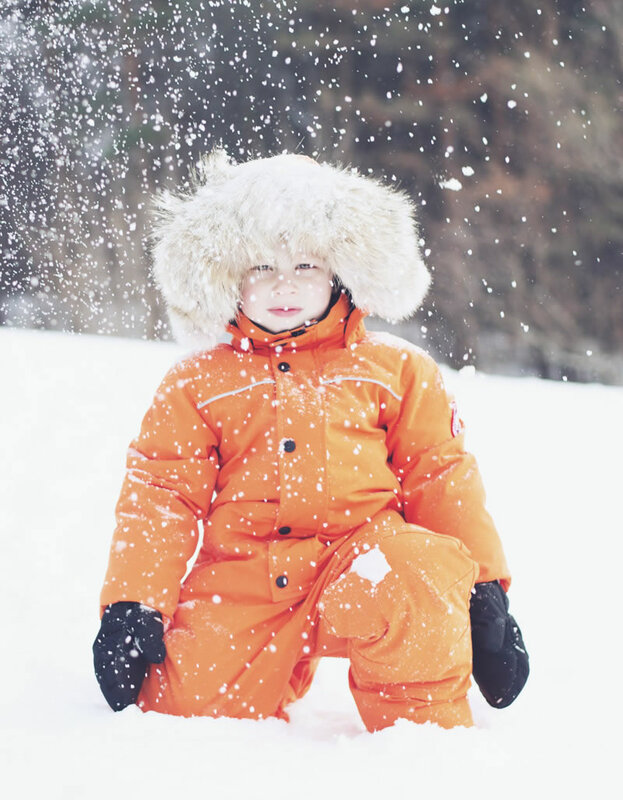 For days that negative temperatures aren’t an issue, the Grizzly Snowsuit utilizes a fabric technology that Canada Goose calls Arctic Tech. 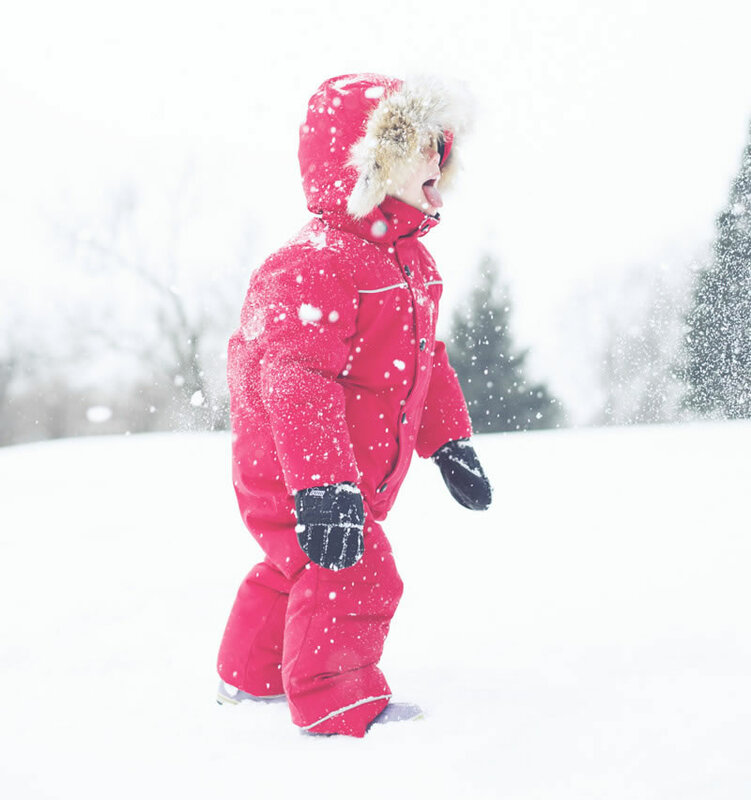 The Arctic Tech fabric is water resistant and extremely durable, with an additional layer of the fabric at the knees and seat of the suit so your kids are guaranteed to stay dry in even the wettest of snow. Additional features that I’ve come to appreciate on the snowsuit are the fleece lined pockets to warm hands, glove hooks to prevent losing a mitten while digging in the snow, and elastic snow gators to keep snow from getting into boots. As great as the Canada Goose Grizzly Snowsuit is, it didn’t just impress me because of how it handled the extreme cold temps. 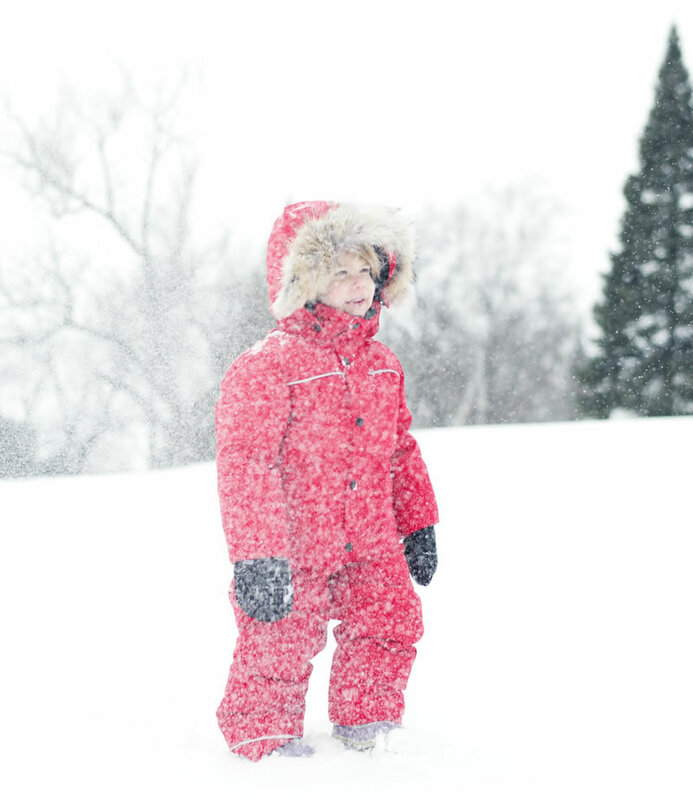 Canada Goose also thought about extending the life of the snowsuit when designing it, because there’s nothing worse than buying gear for your kids that only lasts one season. 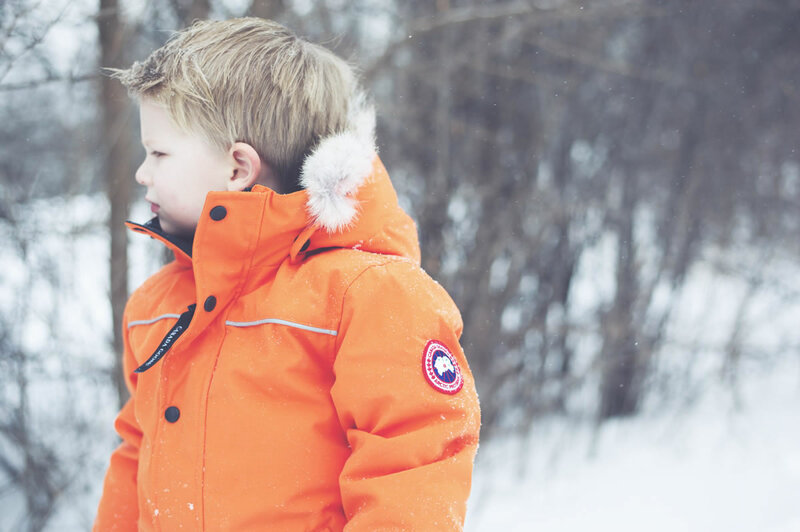 To combat your rapidly growing child from outgrowing their winter gear, Canada Goose created the Gosling Graduate system – an ingenious way of prolonging the life of their children’s winter wear. 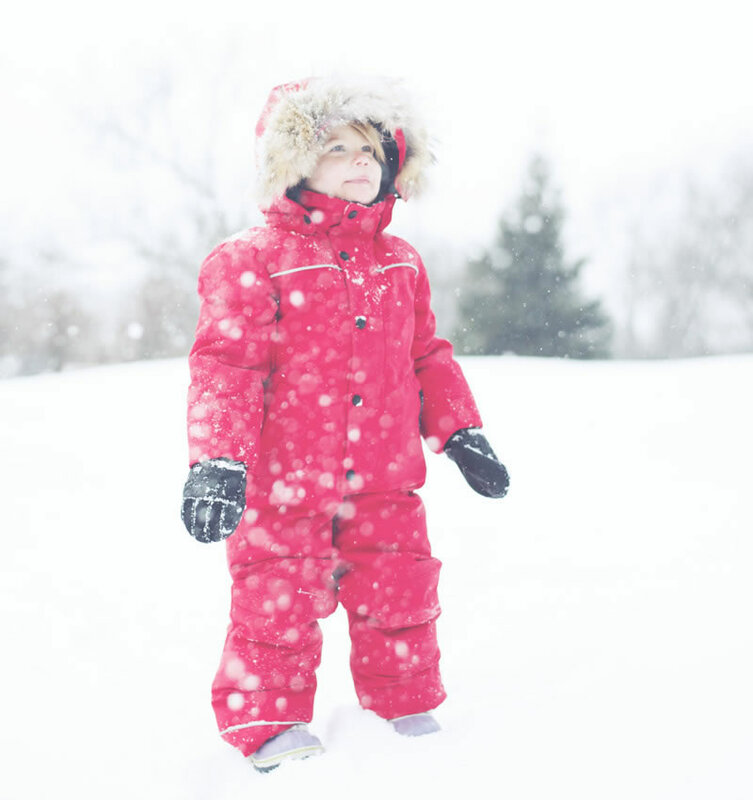 The Gosling Graduate System allows you to add 1 1/2 inches of length to the sleeves and 2 inches to the legs by simply turning the snowsuit inside out, trimming the red stitching, turning it rightside out and pulling. 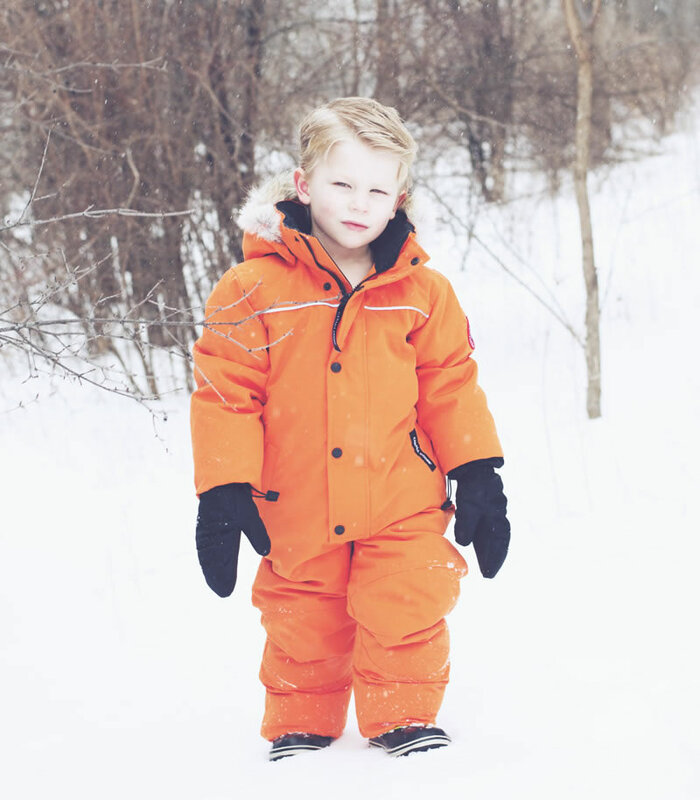 Once your child has outgrown his snowsuit, you can still pass it down to smaller siblings by realigning the growth pleats and adding stitches back in. 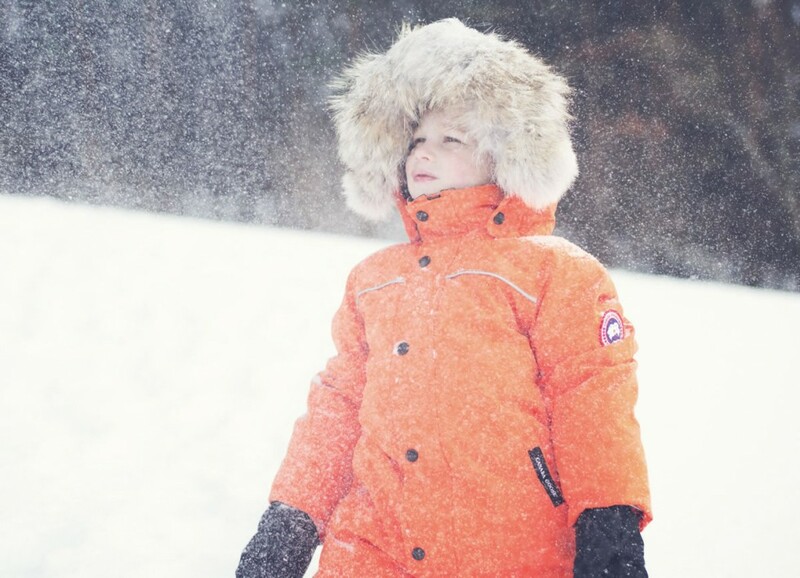 At $495, the Canada Goose Grizzly snowsuit is an investment, and one that I debated for quite a while. 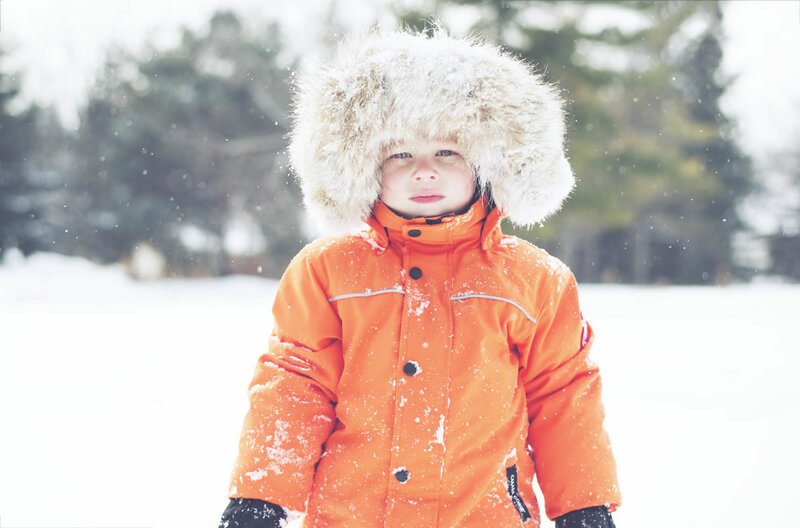 But when I considered what I was really getting from the Grizzly Snowsuit – multiple years of use from a quality piece of gear that keeps my kids warm no matter how harsh the conditions – the Canada Goose Grizzly snowsuit is really without equal. It’s an investment, but one whose benefits easily outweigh the cost.